Thank you for your interest in adopting an Akita. 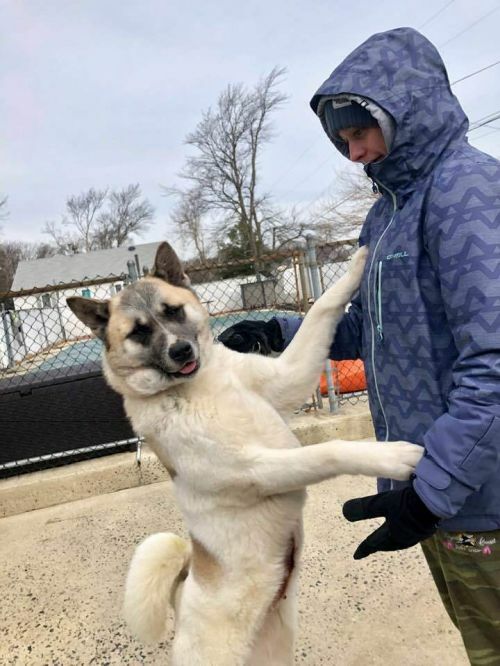 Please know that you must be willing to travel to meet the Akita you are interested in at the foster location, most likely in New Jersey. Are you ready to adopt an Akita? Please fill out the adoption application. Click the smaller photos below and they will appear in the larger photo window. 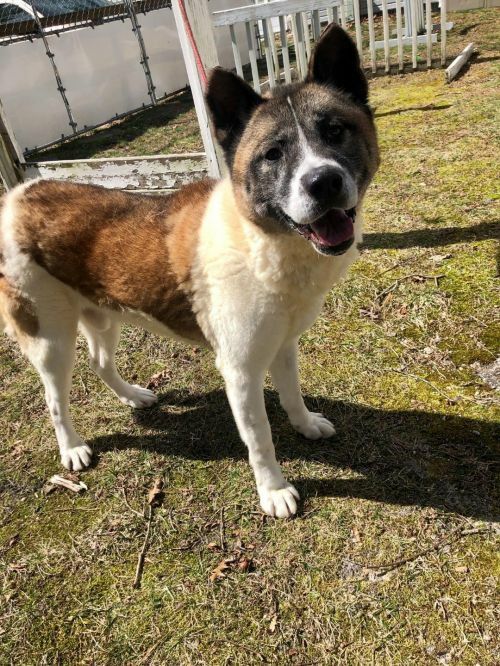 Sweet Bunny is a 4-5 year old female Akita who is a very friendly and submissive gal. She comes to us after being released from a commercial kennel in PA. Bunny is affectionate, loving, and very docile. It is very possible Bunny can live with the right male dog after proper introductions. Bunny has been spayed, gastroplexied, and is current on all shots. She is also micro chipped, and heart worm negative. 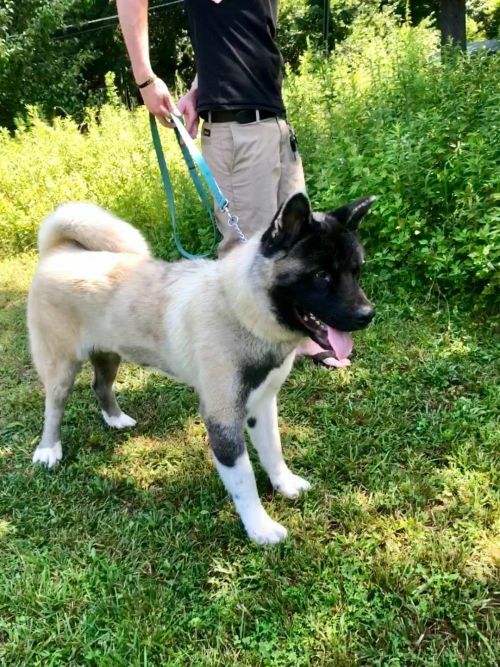 Interested in this Akita ? Please go to our website at www.bigeastakitarescue.org and fill out an online adoption application for Bunny ! The Count is new with us at BEAR! He will be making his way up north in a few weeks, so please check back soon. Thanks! Interested in adopting this big fellow? Please go to our website at www.bigeastakitarescue.org and fill out an online adoption application. 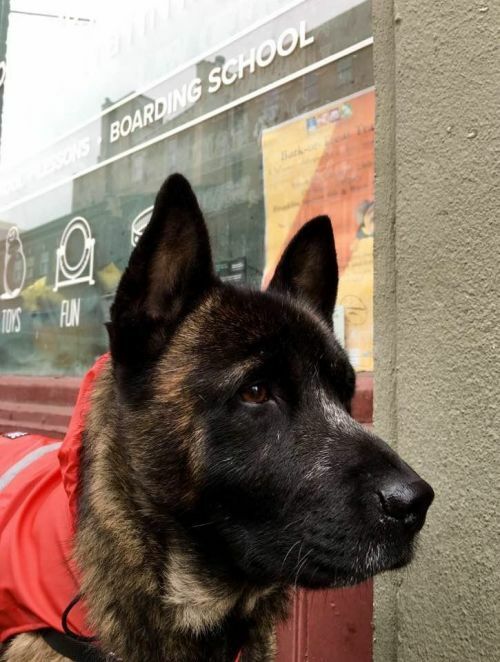 Zania is a very friendly female akita who will be going us here at BEAR this coming week . Please check back soon for up dates Interested in adoption ? Please go to our website at www.bigeastakitarescue.org and fill out a online adoption application . Thanks ! Big, beautiful, and bonded adult pair of six year old Akitas are waiting for their new home. Both are friendly, social, and outgoing. They will need a yard with a secured 6 foot fence. Both are leash trained, house broken, healthy, and love people. These social butterflies can't wait to meet you! Oh, and Louie loves the pool!! 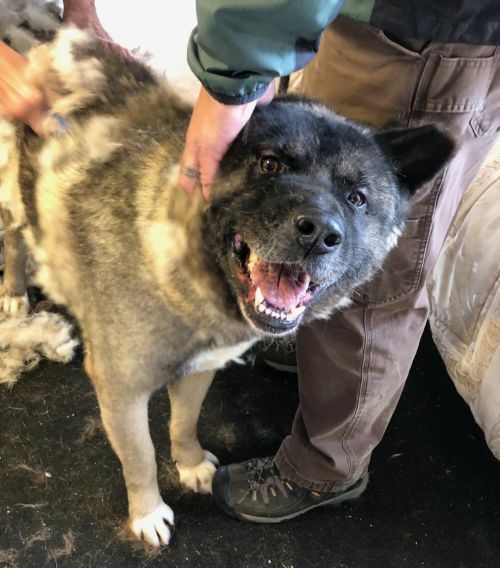 Are you interested in adopting these two Akitas? Please go to our website under available Akitas and fill out an online adoption application. Please be sure to completely fill out the form before submitting. Meet smiling Josie, a beautiful 20 month old Akita. Josie originally came to us from the commercial breeding industry in MO. At a young age, Josie has already had her fair share of puppies, however this has all changed because now Josie is spayed and is in rescue looking for her forever home. Josie never meets a stranger; she is friendly, submissive, and gentle. She wants so much to play and will need to learn how. It is best Josie go to a home with a large confident male dog who can make her feel safe. Josie is ok on leash, but could use a little work as she can sometimes walk in a circle and we are working on this. She loves to run in the yard and is learning how to be a dog and play with toys. Are you interested in adopting Josie? Please go to our website under available Akitas and fill out an online adoption application. Please be sure to completely fill out the form before submitting. 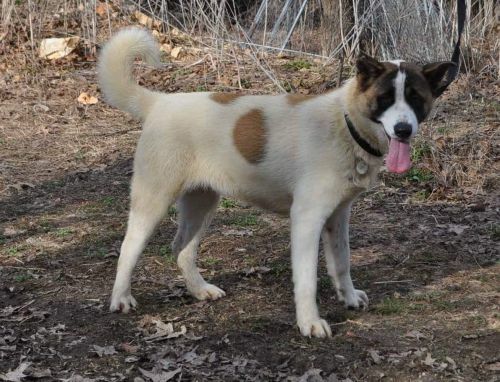 Meet Katy, an 11 month old Akita that has come to us from a commercial breeding kennel in MO. Katy is learning what its like to be a dog at BEAR. In the past she was only used to produce puppies and turn a profit for her owner. When we when received Katy, we noticed she came to us with a broken toe that was left to healed up on its own in a twisted position. This doesn't stop her from running and walking. Katy loves to run the yard and is learning how to play with her toys. On leash she can pull some, but we will work on this. We feel Katy can live with the right male dog so a meet and greet would be needed. Would you like to help Katy and teach her how to be a much loved member of your family? 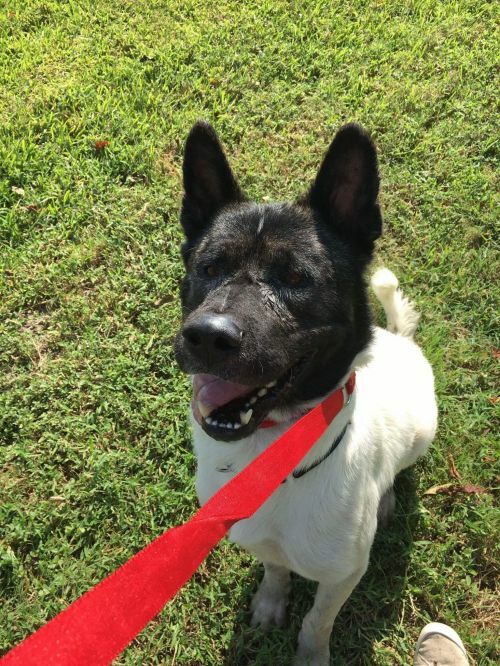 Are you interested in adopting this Akita? Please go to our website under available Akitas and fill out an online adoption application. Please be sure to completely fill out the form before submitting. Rosie is currently awaiting transport, please check back soon for updates. 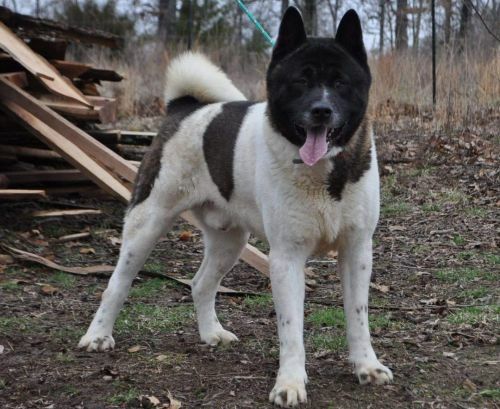 Are you interested in adopting this Akita? Please go to our website under available Akitas and fill out an online adoption application. Please be sure to completely fill out the form before submitting . 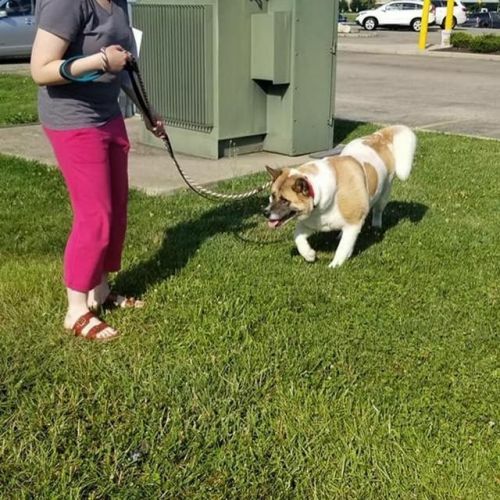 Interested in adopting this akita ? Please go to our website under Available akitas and fill out a online adoption application . Be sure to fill out the form completely before submitting . Violet will be joining us soon at BEAR. Please check back soon for updates. 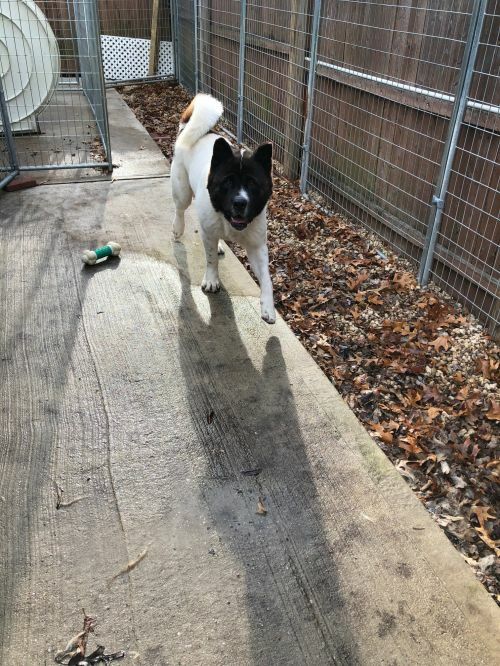 Are you interested in adopting this Akita? Please go to our website under available Akitas and fill out an online adoption application. Please be sure to completely fill out the form before submitting . Daisy is awaiting transport to us. Please check back soon as we will update her page once she arrives. 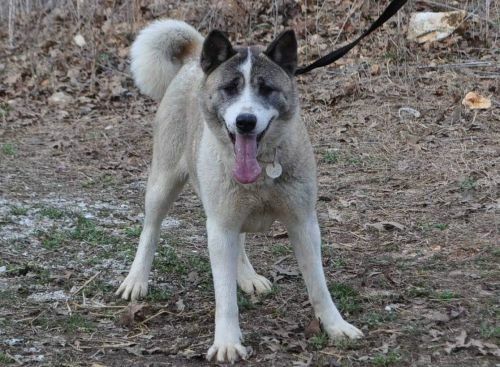 Are you interested in adopting this Akita? Please go to our website under available Akitas and fill out an online adoption application. Please be sure to completely fill out the form before submitting . Lilly will be joining us the week of April 15th. Please check back soon for more information. 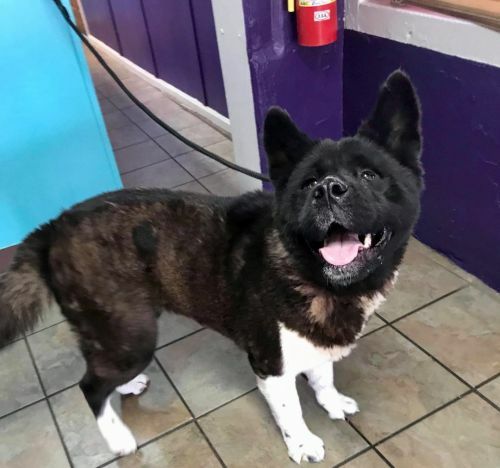 Are you interested in adopting this Akita? Please go to our website under available Akitas and fill out an online adoption application. Please be sure to completely fill out the form before submitting. Boomer will be joining us the week of April 15th. Please check back soon for more information. 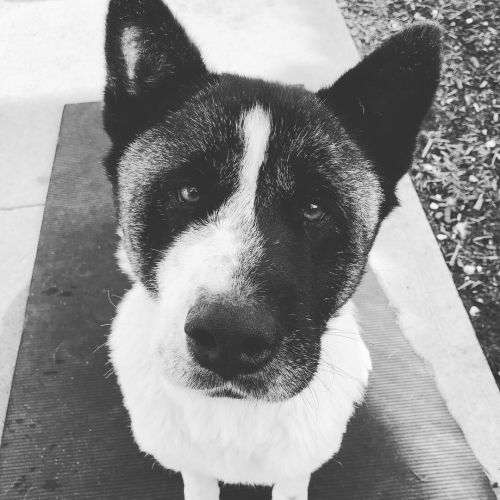 Are you interested in adopting this Akita? Please go to our website under available Akitas and fill out an online adoption application. Please be sure to completely fill out the form before submitting. Meet Cindy Lu! 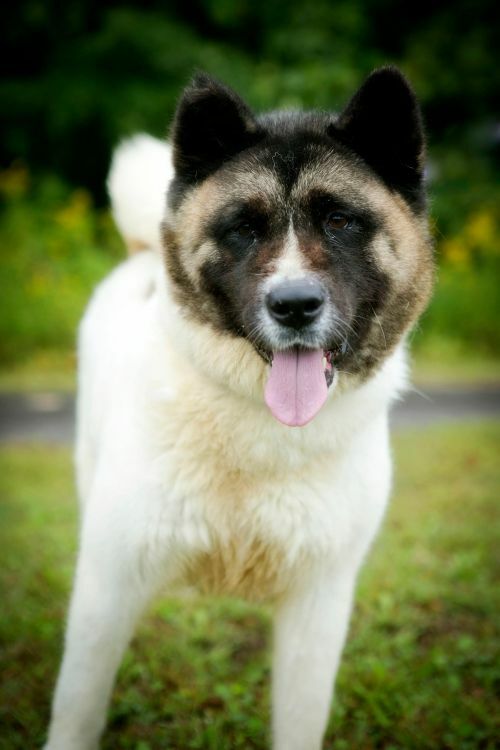 This young beautiful Akita is quiet, gentle, and affectionate. Cindy walks well on leash, is immaculate in her run, and has wonderful manners. Cindy Lu can live with the right large confident male dog after a proper introduction. When first meeting Cindy she is aloof but polite. Give her a few of her favorite cookies and you have gotten yourself a buddy. 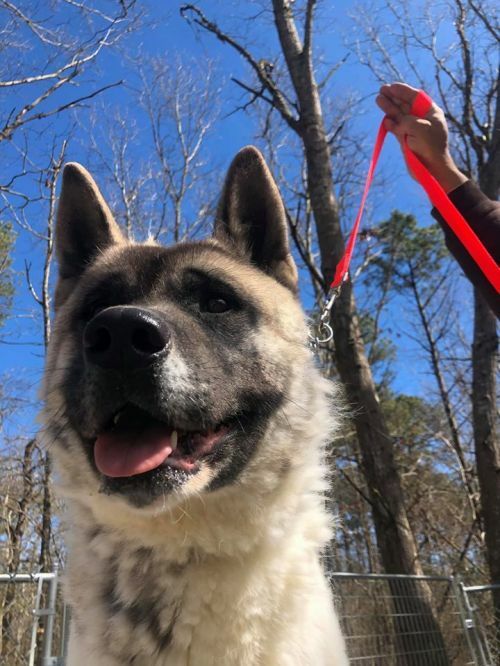 Are you interested in adopting this Akita? Please go to our website under available Akitas and fill out an online adoption application. Please be sure to completely fill out the form before submitting. Robby came to us as a stray from the city of Philadelphia. It sadly appears this boy was kept mostly outdoors. Since coming to us at BEAR he has finally started to put on some much needed weight. So far Robby has been easy to handle and enjoys being pet and given attention. As we get to know this big boy we will post updates, so please check back soon. 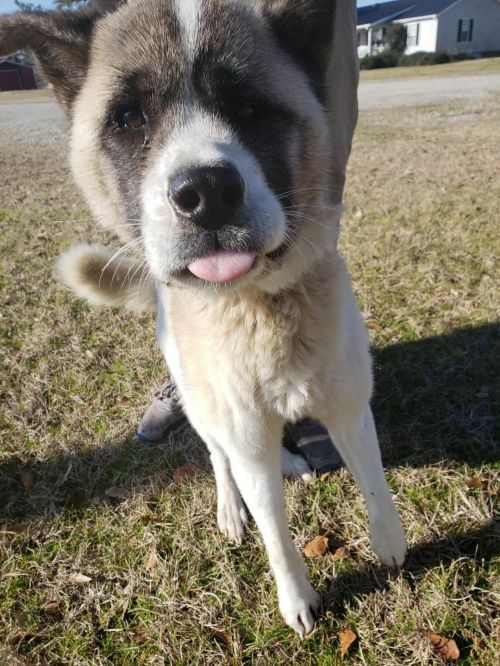 Are you interested in adopting this Akita? Please go to our website under available Akitas and fill out an online adoption application. Please be sure to completely fill out the form before submitting. Meet Miss Zoey! 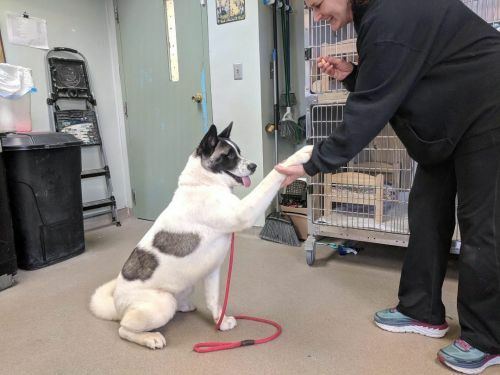 Zoey has come to us after her owner became ill and was forced to move into a place where he could not keep his beloved Akita. Zoey's owner loved her deeply and it pained him to have to do what was best for his girl. Zoey is wonderful! Great on leash, minds her manners in the home, she is friendly and outgoing to all humans. Zoey was very much loved and it shows. Can you give Zoey a new home? Her dad would be forever thankful. Please go to our website at www.bigeastakitarescue.org and fill out an online adoption application. Zoey won't be around long! Sweetie Pie is just that, Sweet as Pie! This gal was left at a rural NC shelter by her owner after a move. Sweetie was extremely underweight, filthy, and clearly neglected. Despite all of this, she remains loving towards all people. She has shown to be good around other dogs also. We have not cat tested her yet but will soon. Once Sweetie gains some weight and gets to an adoptable state she will be transported up to NJ from NC. Interested in this wonderful girl? Please go to our website at www.bigeastakitarescue.org and fill out an adoption application for Sweetie. She won't be around long! 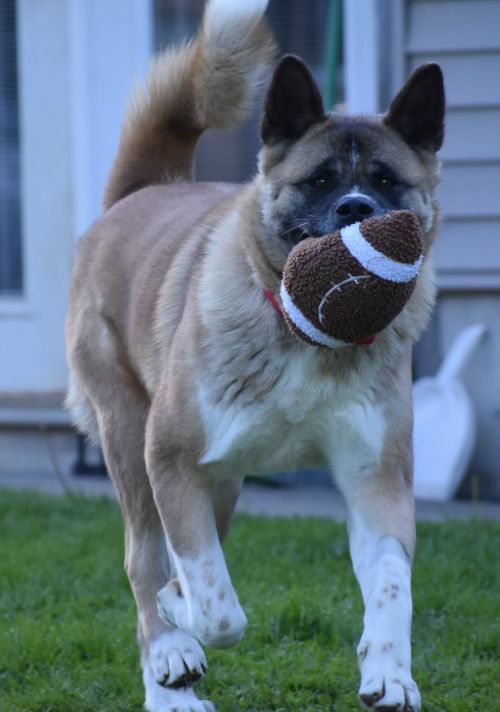 Whimsy is a one of a kind Akita girl! She would love nothing more than to be by your side enjoying cuddles and being petted. Whimsy first came to us from another rescue after she gave birth to a litter of puppies. Whimsy is a puppy mill survivor, and since being rescued she has learned some basic commands, to walk on leash, as well as how to live in a home. It is possible she can live with the right male dog. Whimsy loves children, belly rubs, and would do best where someone is home most of the time. Are you interested in this special girl? Please go to our website at www.bigeastakitarescue.org and fill out an application for her. Delta Rose has arrived! Originally from the Cleveland, MS Animal Shelter where she made her way to Memphis, TN . From there she was picked up by Jim Murray and driven up to NJ to find her forever home. Delta is friendly and social. There is a possibility she might have some hearing loss, however it doesn't affect her wonderful and outgoing personality! Delta appears to mind well around other dogs, rides well in the car, loves her toys, and taking long walks. This gorgeous girl is always happy and is sure to bring a smile to your face!!! Come meet her! If you are interested in Delta Rose, please go to our website at: www.bigeastakitarescue.org and put in an online adoption application and we will get back to you. Thanks! Tsunami will be joining us at BEAR hopefully at the end of April. We have been told about him by our vet team in Texas is that he is a big happy boy that never meets a stranger. This one year old male is currently working on his leash manners while awaiting transport to us from Texas. Tsunami was left at a rural shelter in Texas when his family moved away and could not take him. He is a super nice boy and needs some training which we will work on. 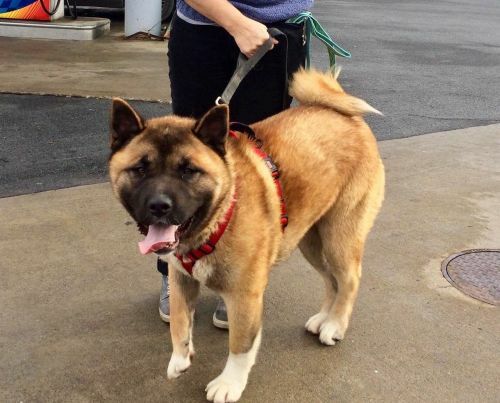 Are you interested in adopting this Akita? Please go to our website and fill out an online adoption application. Please be sure to completely fill out the form before submitting. 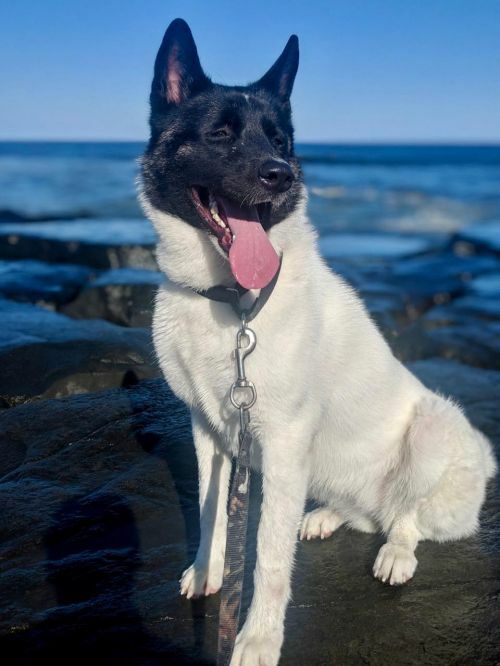 Sushi is a young female Akita who loves people! She is friendly, playful, and happy! She walks well on leash, is clean in her kennel, and is learning how to play with toys. 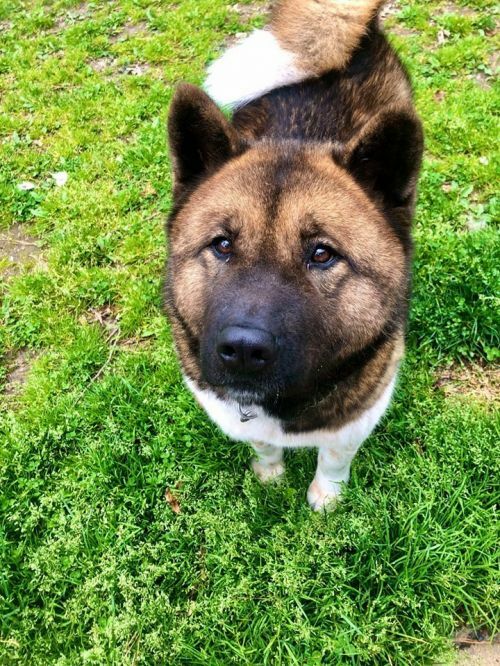 Sushi can go to a home with children who know how to respect the Akita breed. Its possible Sushi can live with the right male dog after a proper meet and greet. Interested in meeting this beautiful and friendly girl? Please go to our website at: www.bigeastakitarescue.org and fill out an online adoption application and we will get back to you shortly. Cash is here! This 11 month old puppy is full of personality. Cash is a heavy, stocky boy so we expect him once matured to top out at over 100 pounds. Cash would do best in a home of his very own, he is friendly and social with all humans, and loves nothing more than to play. Cash is strong on leash but once he does his businesses he does come down. Cash knows sit and takes food and treats gently. Cash would do best with a active family that will give him the exercise he requires. Cash is housebroken and well mannered. He has a very silly side that will keep a smile on your face and in your heart. Interested in this big gorgeous baby? Please go to our website at www.bigeastakitarescue.org and fill out an online adoption application. Sapphire has arrived and what a gem she is! This young female loves to play and loves people. She is good on leash, house broken and quiet . Sapphire would love a home with a big fenced in yard and maybe a few children to play with. This girl is very silly and has a ton of energy. Are you the right home for this little spitfire? Are you interested in Sapphire? Please go to our website at www.bigeastakitarescue.org and fill out an online adoption application. This girl won't be around for long! 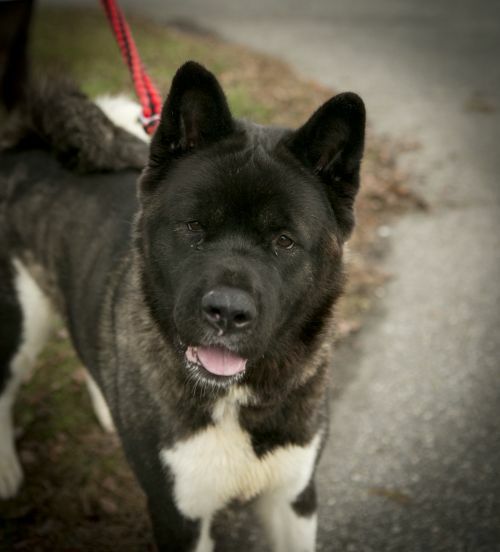 Meet Gabe, a quiet young male Akita who will need a gentle touch, and a home that is low key. He is very unsure when first meeting him, however given some time Gabe will blossom and become your best friend. He could really use a home that can help him build confidence and trust. Interested in Gabe? Please go to our website at www.bigeastakitarescue.org and fill out an online adoption application for gentle Gabe. Roxie is between 5-6 years of age. Her original owner died and she was taken to the shelter where she was adopted out and lived with a male dog for two years. Sadly her current owners had to surrender her again due to unforeseen circumstances. Roxie is well mannered, knows commands, and is a very good girl in the home. She can live with the right male dog and has a history of living with children between 9-10 years of age without issue. This beauty has it all! Interested in giving this gal a second chance? Please go to our website at www.bigeastakitarescue.org and put in an online adoption application now for Roxie! Max was adopted out from us 8 months ago to a home in the city. Max did great, completed obedience training , he was well mannered and affectionate. Sadly Max was returned to us suddenly after a altercation involving food happened with the resident dog ( There were no punctures , and no vet visit required ) . That said its best Max be a only pet. He would do great with a confident owner who could give him the time, love and commitment Maxx truly deserves. This dog has been let down by his past owner and has completely shut down , please only serious injuries . Interested in Maxi Man? Please go to our website and put in a adoption application for Maxi. This sweet pup boy wont be around long. Gigi was found running loose with what we believe to be her sister Bea. Both girls were picked up and taken to the shelter and were never claimed. When first meeting Gigi she will need a few minutes to warm up, but with a cookie or two and you have a new friend. We feel a quiet home would be best for Gigi, and she would do best in a home with the right male dog after a proper introduction. Gigi would love nothing more than spending time with her family, lying under a shady tree and just watching the day go by. Are you interested in Gigi? Please go to our website at: www.bigeastakitarescue.org and fill out an online adoption application for this sweet and quiet girl. This big guy (115 pounds) loves to play! Mel was left at a NJ shelter after his owner was moving. Mel will need a breed experienced owner, one that also has the physical strength to handle a big bouncy juvenile male. Mel knows some basic commands and is food motivated. Mel has been fully vetted and would do best in a large securely fenced in back yard where he can get plenty of exercise. While living at BEAR, Mel has made friends with two of our females! He is playful with both females however he will not tolerate a male dog in his space. It is best that he not be placed with small animals or small children, as he is big and bouncy and could knock over a small child or an older person. This is a big strong boy who clearly has no idea of his size and strength. 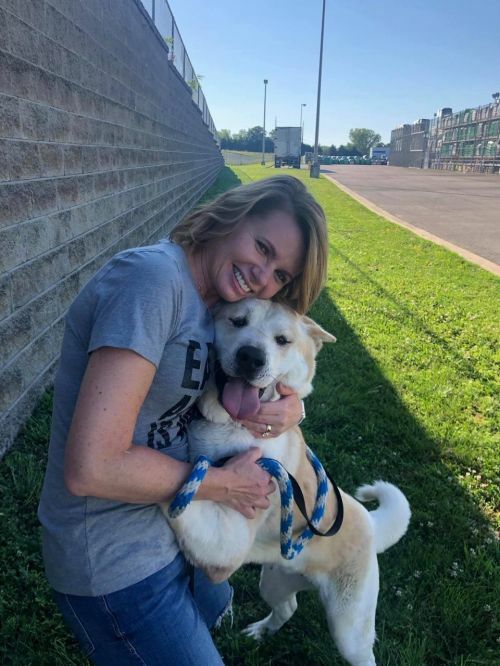 Do you think you have what it takes to give this big happy guy a safe home? Please go to www.bigeastakitarescue.org and fill out an online adoption application for Mel-Man! Kain was found during the hurricane in Texas in terrible condition. That has since changed . Kain has gained some much needed weight however we could not get his skin to clear up , Upon further testing it showed us Kain had a low thyroid and SA confirmed by skin biopsy . 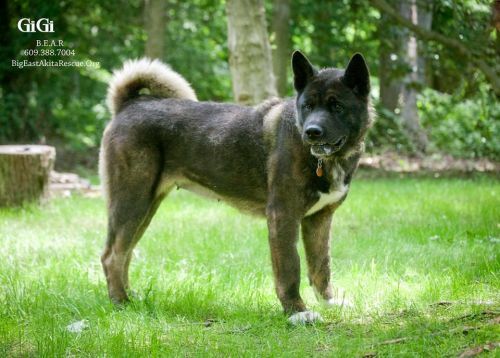 SA is a auto immune disease that does show up in the akita breed. It is very manageable and requires low doses of prednisone and oil baths. The low thyroid pretty much goes hand in hand with a auto immune problem and is managed on a inexpensive thyroid medication given daily for life. 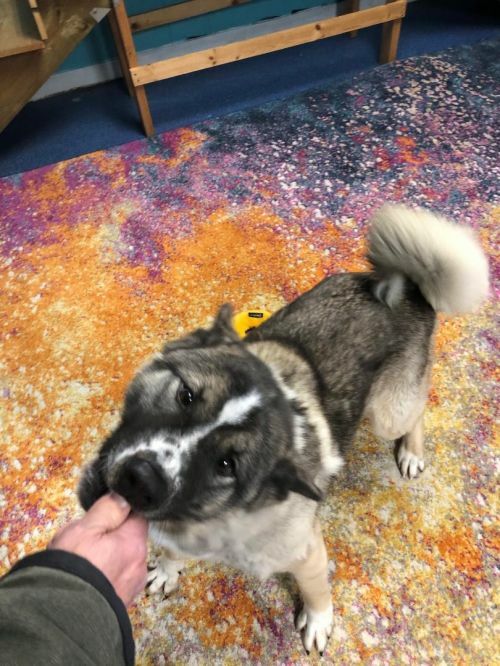 We at BEAR felt this akita is exceptional in temperament, he is friendly, loves people does well around other dogs and is so very grateful for walks, good food and being loved. We felt in our hearts due to him being such a sweet fellow he deserved as much as a chance as possible. Do you have a heart big enough to take on a special needs pup like our Kain ? 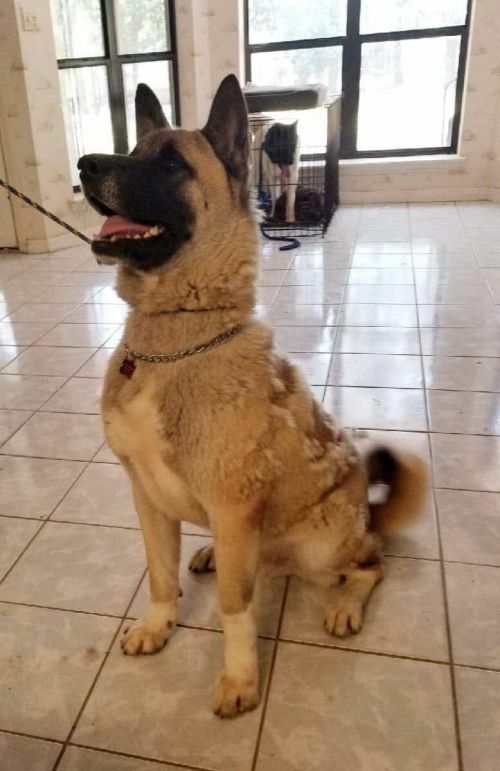 SA support group : https://www.facebook.com/groups/182023095200511/about/ If you are interested in giving this big boy a place to call home, please go to www.bigeastakitarescue.org and put in an online adoption application for Kain. Percy comes to us from a puppy mill out in Southwest MO. This big handsome fellow, is just gorgeous in person. 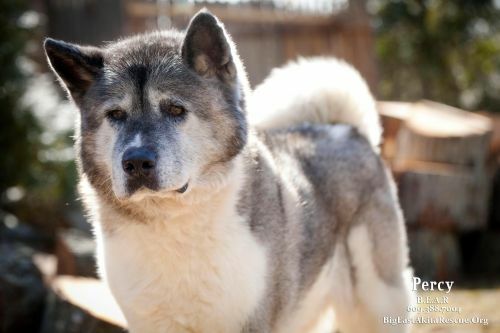 Percy can be aloof in typical Akita fashion, give him a little time and some sweet talk, and you will have won him over! Percy is great on leash, loves his walks, loves his toys and enjoys spending time with his people. Percy is a calm, nice boy, with good manners. We feel he would do best in a calm adult home that is breed experienced, Do you have the right home for this big sweetheart? Please go to www.bigeastakitarescue.org and put in an adoption application online for him. Brooklyn our beautiful diva comes to us from where else? Brooklyn! When first meeting Brooklyn she will need a short time to warm up, a cookie, perhaps a designer purse or two? She will approach you as she sees fit. Brooklyn is one of those females who demands respect and she is not willing to lower her standards, no sir! Once she gets to know you she is playful, loves to chase her ball, loves toys, walks great on leash, and is awesome in the house too. She is a confident girl who will make you earn her trust, but once earned, she will be a loyal and loving best friend for life. Can you meet Brooklyn's high standards? Are you interested in Brooklyn? Please go to www.bigeastakitarescue.org and put in an adoption application online for our diva! Brolly has come into our rescue after being left at a rural North Carolina shelter by his owner. His owner never so much as gave a reason as to why he left his best friend at the pound. Since Brolly has been with us, we have gotten to know him and have found he is a playful and energetic guy, who at first takes a little time to warm up. Once he does he is affectionate and polite. Brolly would love to have a big fenced in yard so he can run and play, and boy, does he love play time! He rides well in the car and enjoys long hikes, and will need to go to a breed experienced home as an only pet. This is a happy boy who is looking for an active home to give him that second chance that he so deserves. Are you interested in Brolly Bear? Please go to www.bigeastakitarescue.org and put in a adoption application online for this handsome boy! 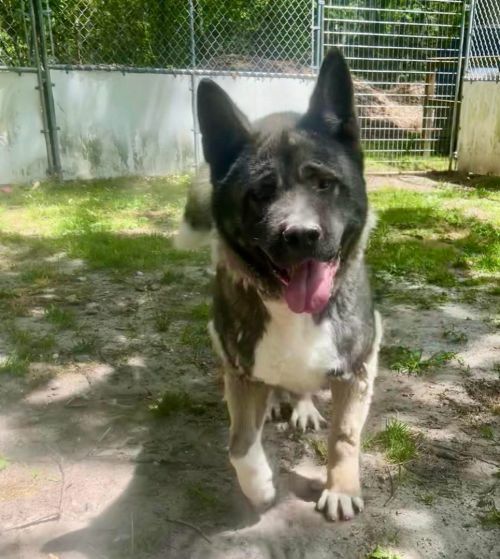 Everett is a young male Akita who has come into rescue after being picked up as a stray in horrid condition and taken to the Philadelphia Animal Control. Everett is a big handsome boy who is approximately 18 months old. He would do well in a home with an owner that is breed experienced and can be a leader in this young male's life. Everett takes time to bond and upon meeting him he will be aloof at first however once a trusting bond is formed he will be a great companion. It is possible Everett can go to a home with the right female dog after a successful meet and greet. Are you interested in Everett? 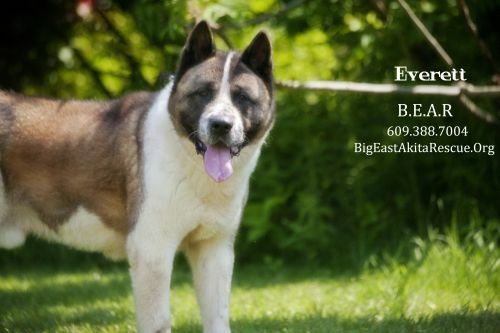 Please go to www.bigeastakitarescue.org and put in an adoption application online for him! 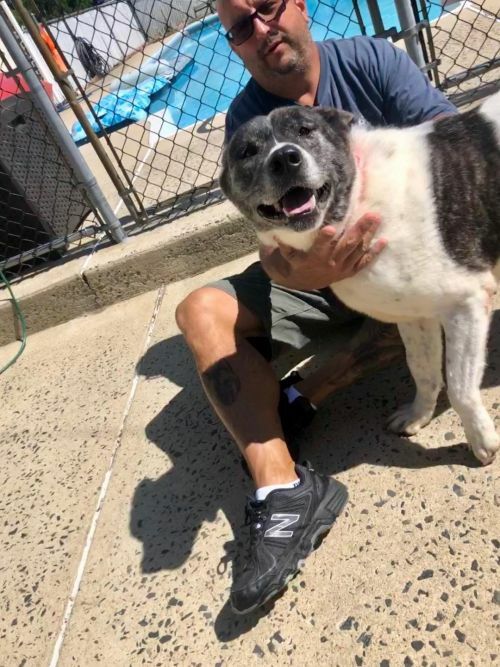 Lulu is a two year-old gorgeous female Akita who was left at the Brooklyn, NY shelter by her owner after the couple had a baby. Lulu is a special needs gal, who is partially deaf. This doesn't stop her from having fun! This big girl (105 pounds) is super playful, loves her Jolly Ball, to run, and take long walks. She does know some basic commands by hand signals. She is a quiet girl, house broken and non destructive. Do you have experience with large deaf dogs? Our big girl Lulu might be for you! Are you interested in Lulu? Please go to www.bigeastakitarescue.org and put in a adoption application online for her.